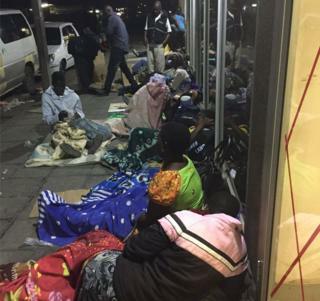 It is midnight and about 30 people are preparing to settle down for the night on the streets of Zimbabwe's capital, Harare. Their floral fur-pile blankets are spread out over cardboard boxes on the cold, hard pavement. The women are on one side, the men on the other. But these are are not homeless people. Some are security guards, traders, and even an accountant and a psychologist and this is a bank queue. "We are forced to sleep here because if you don't, you wont get any money. I have tried coming at 4am but it's a waste of time," says a woman who chose not to give her name. Next to her, her seven-year-old daughter is fast asleep. "Only those that are first in this line will get money. Banks are limiting the number of people they pay out. " She holds out a green piece of paper with the number 10 written on it - her place in the queue. A group of unemployed young men are distributing numbers. By midnight they have already given out 200. One called Muchekadzafa confesses they keep some numbers back and sell them to those who don't want to sleep in the queues for $1 each. "It's an opportunity to survive, because we don't have jobs," he says. Zimbabweans are going to extraordinary lengths to withdraw their savings. Often, it's an agonising wait with no guarantees. Banks are open 08:00-15:00 on weekdays and 08:00-11:30 on Saturdays. The previous day the first 165 people received money at this bank. The others came back the following night and they withdrew $50 (£40) each. They are back again. Banks have gradually slashed withdrawal amounts over the past year, from $2,000 a day to $100. But most people are lucky to get anything at all. Seven years ago the southern African country abandoned its local currency, which had been made worthless by inflation rates that reached 231 million per cent, and adopted a basket of currencies, mainly the US dollar. The policy change wiped out the Zimbabwe dollar savings overnight, but helped stabilise the economy. Now industries are failing to produce enough goods, imports are outpacing exports and the country is running out of money, again. The central bank has announced plans to introduce a new surrogate currency within the next month but no date has been announced. "Maybe bonds will end queues, if it means we can sleep in our beds again, it might be the only solution. It doesn't matter that they don't [have] value outside the country." The government says the so-called bond note will be pegged in value to the US dollar. But the reaction has been violent, as many people fear it will suffer the same fate as the Zimbabwe dollar. Opposition supporters and members of public have shut down the city centre and blockaded roads with burnt objects in the most violent demonstrations in recent years. They have called for President Robert Mugabe to step down for failing to stem the economic crisis. The announcement of a new currency has also sparked old fears of hyperinflation and fuelled panic withdrawals, especially among the tens of thousands of traders who need foreign currency to buy goods in South Africa for sale locally. "There is a lot of uncertainty. We are afraid of bond notes because we don't have confidence in it," says Stanley Kufandirove as he waits in the queue. "If its going to help us it's fine, but the issue is confidence - unless we believe in this bond note, it won't work." An elderly woman who works as a cleaner is more hopeful: "Maybe bonds will end queues, if it means we can sleep in our beds again, it might be the only solution. It doesn't matter that they don't [have] value outside the country." Zimbabwe's central bank has produced media jingles and plans to embark on a road show to ally public fears. It denies that the bond notes are a way of reintroducing the Zimbabwe dollar through the back door. Rather they will be paid out as an incentive to mineral and agricultural exporters at a rate of 5% for every dollar earned. The bank's governor John Mangudya says they will not overprint the note, which is backed by a US $200m facility. Mr Mangudya has told the public: "If you don't want the bond notes, use plastic money." An elderly man who didn't want to be identified says he still has trillions of worthless notes stuffed in boxes at home. "Why should we expect more? It's all the same fake money." Themba Dube is resigned: "They are giving us bond tissues, worthless money, but where are they putting the hard currency? "We are our on knees as a people, we have no choice and it might help to end queues. "Even if they decide to give us leaves we will accept them. But before the bond notes come, I want to withdraw my cash and leave the account empty." Zimbabwe shutdown: What is behind the protests?